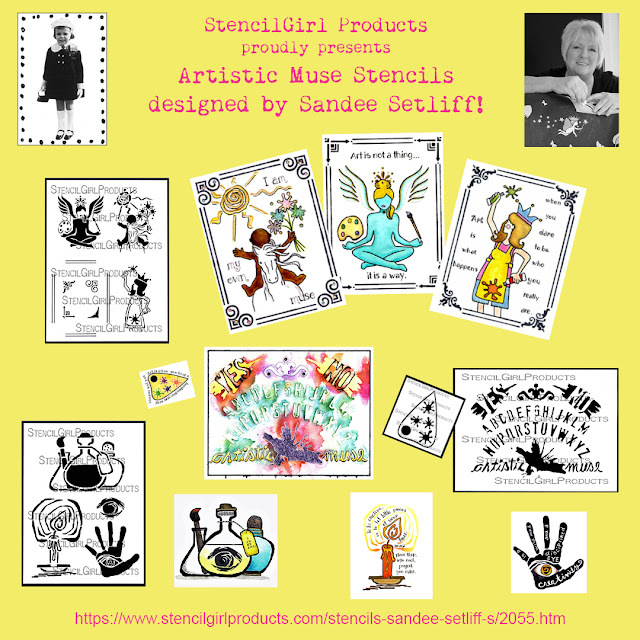 StencilGirl Talk: Frolic with flowers, send jack-o-lanterns, and access to your muse with these stencils from Sandee Setliff, Jennifer Evans, and new designer Wendy Brightbill! 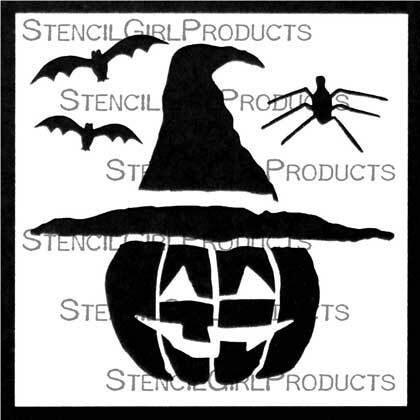 Frolic with flowers, send jack-o-lanterns, and access to your muse with these stencils from Sandee Setliff, Jennifer Evans, and new designer Wendy Brightbill! Wendy Brightbill's Floral Frolics stencils have arrived in our office and are ready to bloom big in your studio. Wendy is StencilGirl's newest designer, but we also have stencils for you by Sandee Setliff and Jennifer Evans. Sandee's whimsical Artistic Muse stencils are simply delightful. 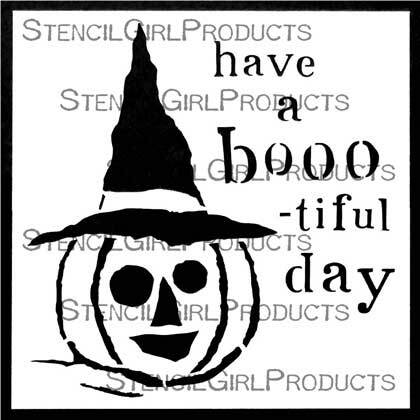 For those of you planning for Halloween parties and decor, Jennifer Evans has a couple sweetly spooky stencils. 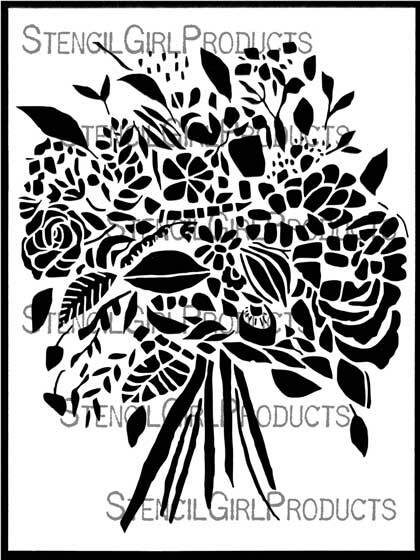 Peony Blooms 6 x 6- The Peony Blooms stencil is an elegant silhouette of Wendy Brightbill’s favorite flower, the peony. 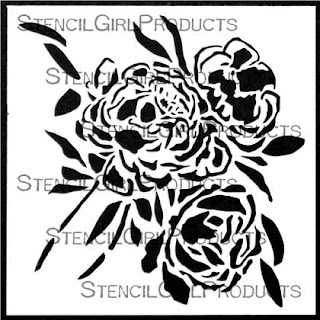 Use this stencil to add peonies to mixed media art journals or a canvas. Embellish old cigar boxes or the cover an altered book. Create dimension by using cold wax medium or molding paste in the stencil. 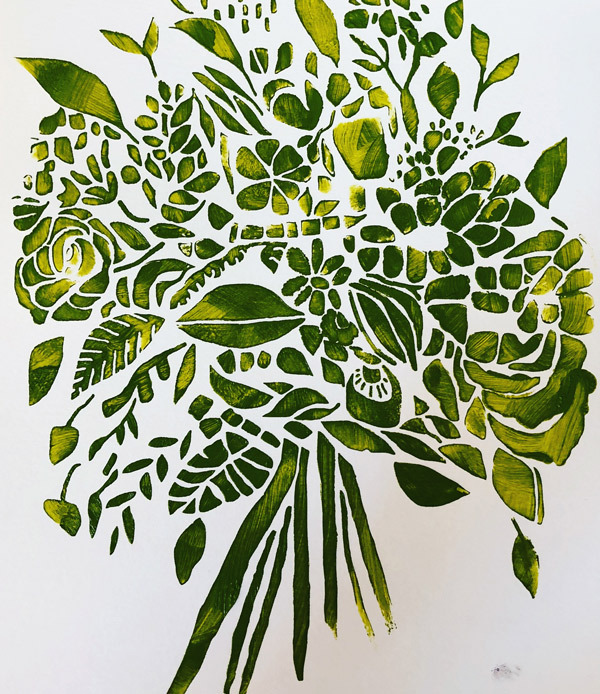 The Wildflower Bouquet stencil by Wendy Brightbill is a playful design of an abstract wildflower bouquet filled with unique flowers and foliage. 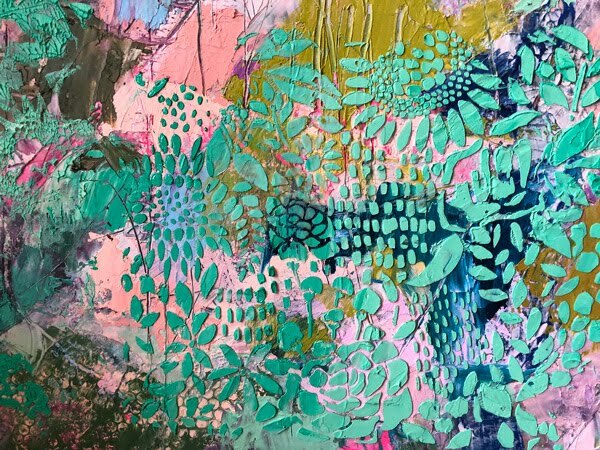 Add whimsical design to mixed media art. 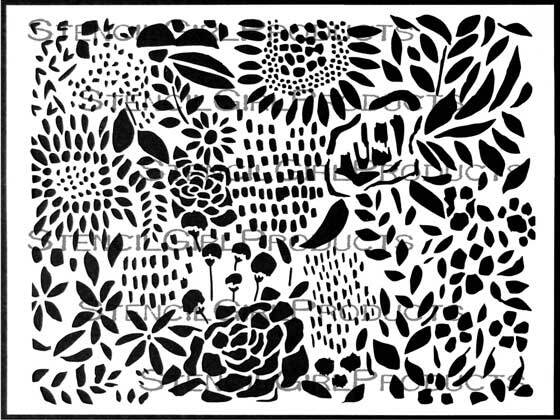 Use this stencil to create a floral background in an art journal. 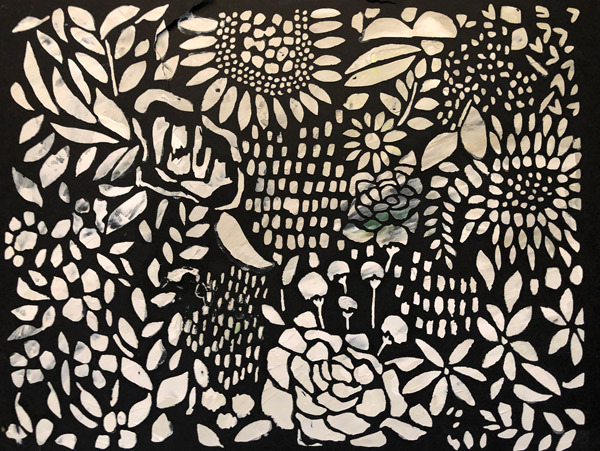 Create painted papers to use in collages. Create three-dimensional flowers with a palette knife and cold wax medium or any texture building medium. 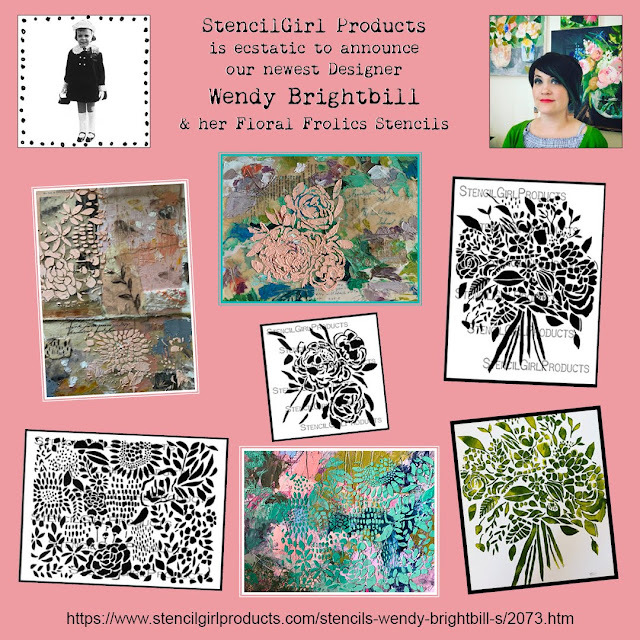 The Floral Frolics Pattern stencil by Wendy Brightbill is an abstract pattern of playful flowers and messy marks. 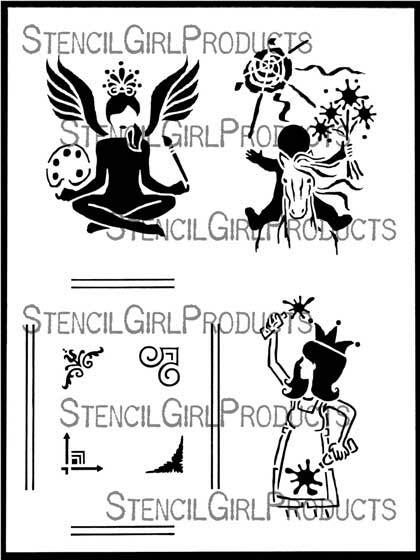 Use this stencil to create homemade wrapping papers, cards or other paper crafts. 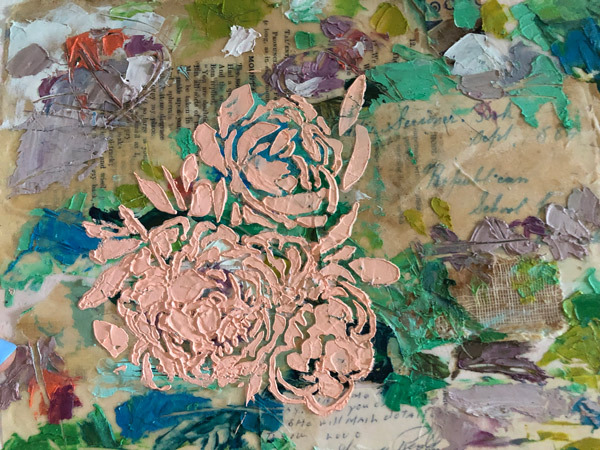 Create playful floral backgrounds in mixed media art pieces. Paint papers to cut up for collage. 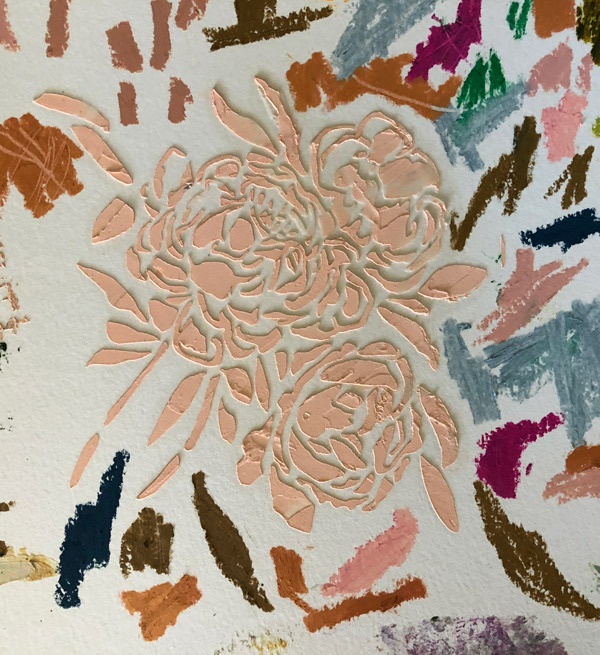 Create three-dimensional flowers with texture building mediums, such as molding paste. 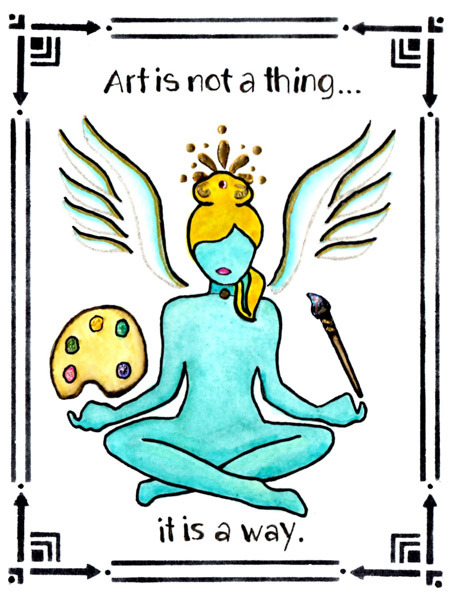 The artist intuition cards are for unlocking our creative strengths. Great for those art journaling moments when we doubt ourselves to remind us; if we can imagine anything then why not imagine being creative and empowering? This artful take on tarot cards will inspire your inner muse to be your constant companion that is both supportive and nurturing. 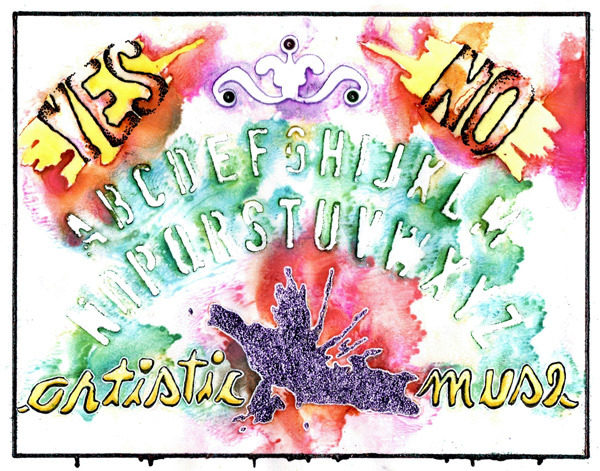 There are no rules here, just a fun take on the spirit board to help us figure out what our muse is trying to tell us. I mean how will you know what it's trying to tell you unless you ask? Great for journaling prompts and decorating for Halloween. The planchette is a playful take on the original spirit board game but this time adapts to the artist palette with paint splatters adorning its form. 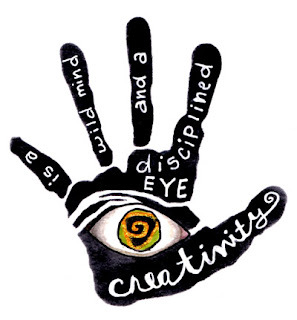 Place it on your artistic muse board and give it a spin to see if it takes you in a new artful direction. 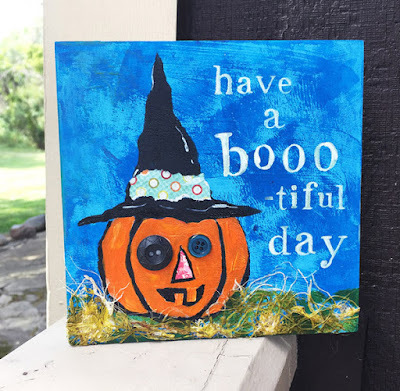 Can also be used alone in art journaling or Halloween decor. The Sun - You are in the right place at the right time. Relax, enjoy the inner artist in you! The child is holding a bunch of paint splatters instead of sunflowers. The Empress - Look for opportunities to be generous, warm, and nurturing. 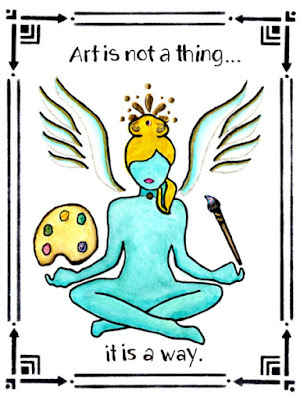 She sits there meditating, balancing her art utensils. 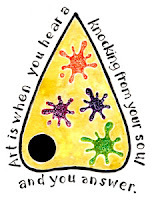 Share your artistic side with the world. No one can do it better than you! You are in control! 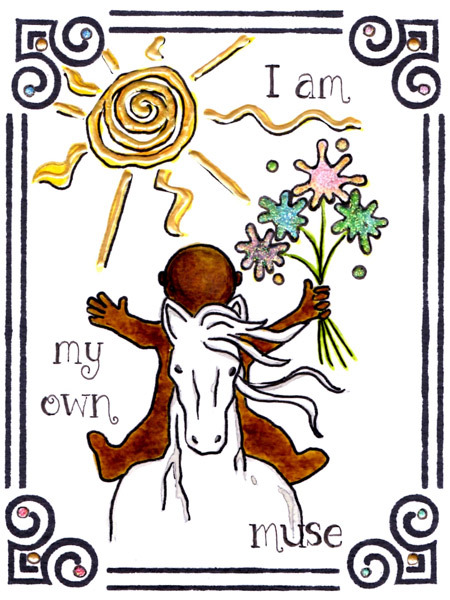 The Fool – Let go of expectations and trust your instincts. 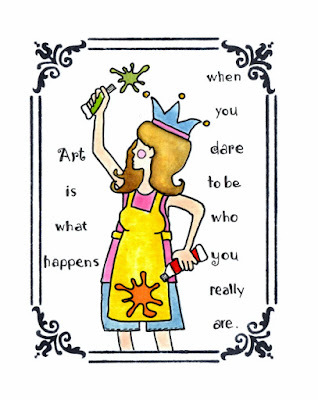 She is running around throwing paint in the air in her art smock and fools crown, happy as a lark without a care in the world! 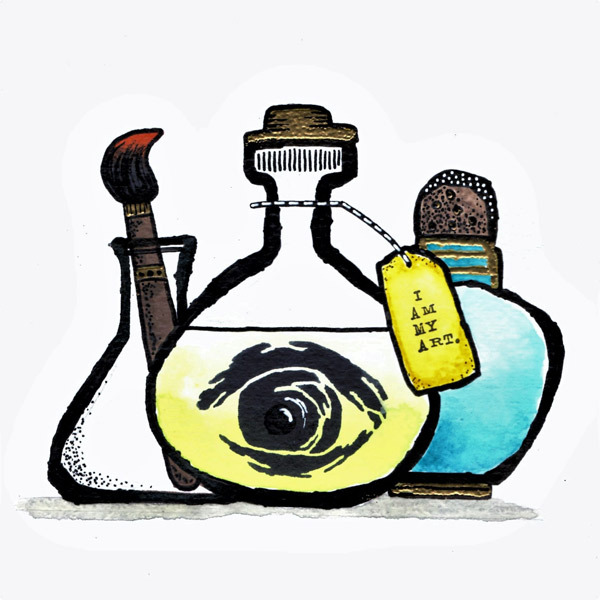 Now that you got your artistic muse on why not experiment with some other elements? Mix up your creativity with some mystical ingredients and get your artistic groove on. 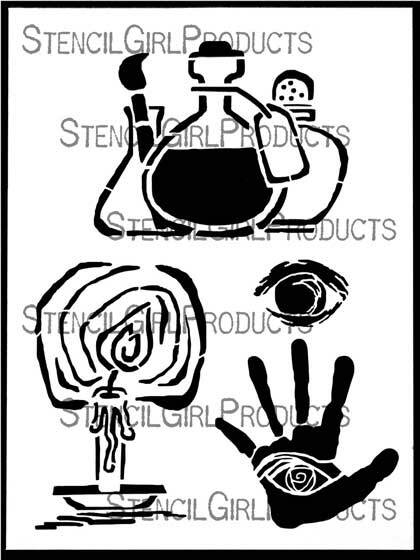 Complete with artful potions, a candle to guide you, an all-seeing eye to watch over you along with a mystical hand symbolizing both abstract and concrete artful energy. 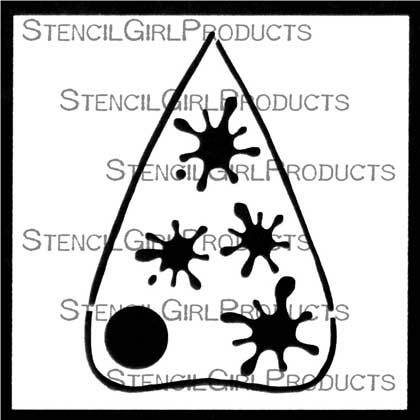 This stencil will be loads of fun to play with. 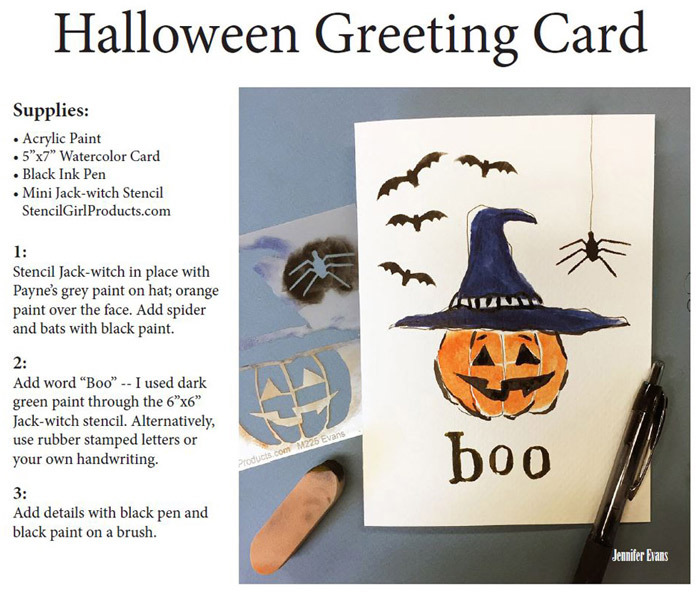 Jennifer Evans' Jack-witch Mini Stencil (pictured below) is sized perfectly for you to make Halloween greetings, party invitations, and decor that is spookily fun! The Jack-witch Boo-tiful Stencil is ready for you to make seasonal decor. Are you counting down to Halloween yet? 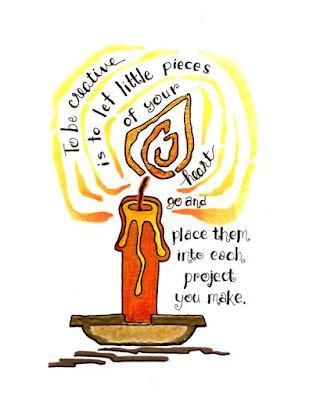 What art will you make to celebrate? Will you frolic amongst the flowers? Or, are you ready to engage your muse in a fun way? 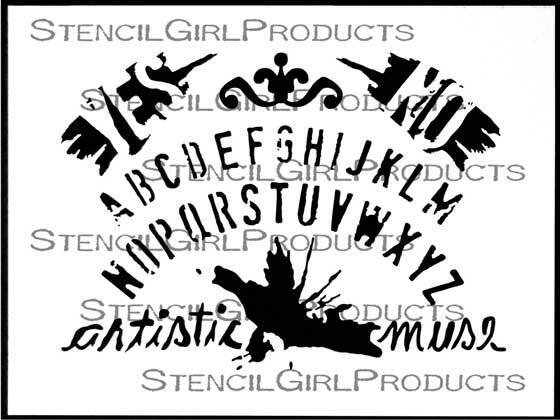 You'll find all these stencils over on StencilGirlProducts.com. Thanks for taking the time to enjoy our blog today! Both of these are just amazing! Such creative stencils!!! Wonderful releases! Congrats to all! I especially love Sandee’s new Stencils. Thank you so much Patricia! !